Welcome! 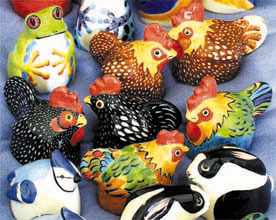 Each whimsical porcelain animal and angel in our line of American craft collectibles is individually crafted and hand-painted. Choose from ornaments, figurines, candleholders, and piggy banks. We even have a new line of salt and pepper shakers (shown above). Our pieces make wonderful gifts and are perfect for corporate gift giving. Ask about easy fund-raising opportunities for your school or organization. NEW DESIGNS and LOWER PRICES on SALT & PEPPER SETS and PIGGY BANKS! You'll find cats and dogs, barnyard folk, woodland creatures, and even some wonderfully wild animals. Salt & Pepper Shakers and Piggy Banks - new designs with great price points! A cheerful chorus of colorful birds from your backyard or the tropics along with owls, penguins, and hummingbirds. 29 breeds of pure-bred dogs and every flavor of cat. Help your customers commemorate special occasions with customized plates and piggybanks. Our little angels carry messages from the heart all through the year. Festive animals and angels celebrate the Christmas season. Wholesale customers: check this page regularly for our latest specials, closeouts, and other bargains.